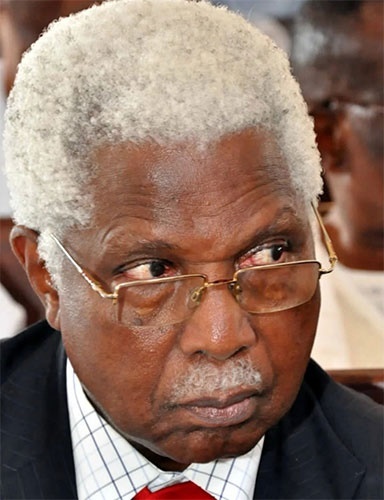 Plans are now underway to give late Alex Ekwueme a state burial. The Nigerian government is planning a state burial for its former Vice President Alex Ekwueme who died on November 19 in London. A committee headed by the Secretary to the Government of the Federation (SGF), Boss Mustapha, has been set up to plan and prepare for the state burial. According to Mustapha, the work plan to be used was in tandem with previous state burial committees. He added that the committee was open to new ideas. "Owing to the top public office he once held in Nigeria, President Muhammadu Buhari thought it befitting to organise a state burial for him. "This is also in keeping with the tradition in that regard, as was done to the late Admiral Augustus Aikhomu, former Chief of General staff that died in 2011. "Same for the late Admiral Mike Akhigbe, former Chief of General staff who died in 2013. "The only difference now is the absence of the Nigerian Navy in the burial committee. However, the Nigerian Police will play the role of the Navy at the ceremony. On Thursday, Vice President Yemi Osinbajo, accompanied by the Minister of Labour and Employment, Chris Ngige met the deceased’s widow, Beatrice, and children – Mr Obi Ekwueme, Mrs Chidi Onyemelukwe and Mr Ogo Ekwueme at their Abuja residence.